WELLINGTON, New Zealand, October 5, 2011 (ENS) (ENS) – A joint New Zealand and United States operation is underway to provide emergency water supplies to the drought-stricken Pacific islands of Tokelau, a New Zealand territory with 1,500 inhabitants. Surrounded by rising seas due to climate change and entirely dependent on rain for drinking water, a severe La Nina weather pattern in the Pacific region has resulted in very low rainfall on many islands. On the weekend the Tokelau government joined the island nation of Tuvalu in declaring a state of drought emergency. “Tokelau is entirely reliant on rainwater collection and is therefore severely impacted when drought conditions occur. Current information suggests there’s less than a week’s supply,” New Zealand Foreign Affairs Minister Murray McCully said today. An aircraft will leave Royal New Zealand Air Force Base Ohakea early tomorrow carrying supplies and personnel to Pago Pago, American Samoa. The supplies being flown up include 12 large, empty military water storage containers. In Pago Pago, the New Zealand team will rendezvous with the US Coastguard cutter Walnut. It has an on-board water desalination plant, which has filled its water tanks providing approximately 136,000 liters (35,930 gallons) of water. The Coast Guard vessel will travel to Tokelau’s three main atolls to deliver the water. New Zealand estimates that this, plus current stocks, will be a sufficient supply in the short term. “The situation in Tokelau is very serious and this immediate action is required to ensure the safe supply of drinking water for the 1,500 residents – all of whom are New Zealand citizens,” said McCully. 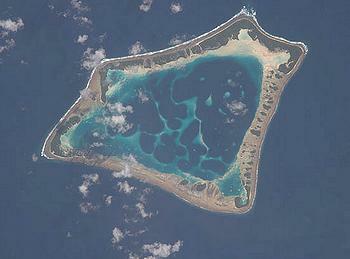 Tokelau consists of three tiny coral atolls located about 483 kilometers (300 miles) north of Samoa. Each atoll, lying three to five meters above sea level, is made up of a number of reef-bound islets encircling a lagoon – a total of 127 islets in all. Each atoll contains one village spread across one or two islets. 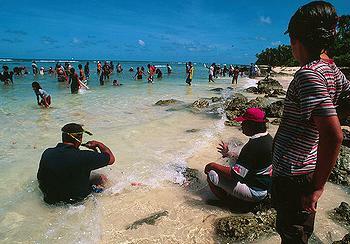 Remote Tokelau has no airport; visitors must fly to Apia, Samoa and then travel by boat to Tokelau. The Apia-based general manager for the Tokelau government, Jo Suveinakama, told Radio New Zealand Tuesday that there is only about a week’s supply of drinking water on the three atolls. Suveinakama said freight deliveries from Samoa have brought bottled water and some supplies to top up community water tanks, enough to last a week. Schools are still operating though pupils have to use toilets in private homes because of the lack of water, he said, most government services are on hold. 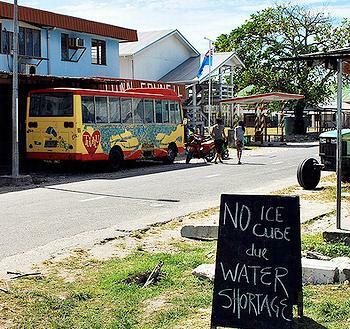 New Zealand also is responding to the ongoing water shortage emergency in Tuvalu, a New Zealand-administered territory with fewer than 11,000 residents. “Repairs are underway to the main desalination plant on Funafuti, and a desalination plant and Red Cross personnel arrived on the worst affected island of Nukulaelae this morning,” said McCully today. Two days ago Nukulaelae had just 60 liters of drinking water left for 330 people. “Early this morning the Tuvalu naval vessel landed the Red Cross and their desalination plant and they were up and running and providing water to the people in the most desperate need,” said Gareth Smith, New Zealand High Commissioner to Tuvalu. New Zealand is considering more aid to Nukulaelae as the island is also experiencing a food shortage. In Samoa, officials at the Samoa Water Authority said last week that streams and rivers across the country have dried up and serious problems will arise if the drought in Samoa continues. Most of the islands’ water catchments are less than a quarter full and rationing is now part of daily life. In August, the government in Samoa began drilling new boreholes for drinking water while trucking bottled water to thirsty villages.